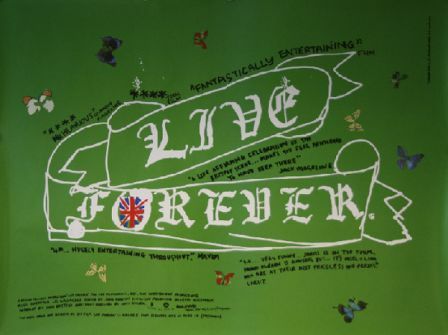 In 2003 John Dower’s Brit Pop documentary “Live Forever” was released….Featuring the talents of Oasis, Blur, Pulp, Jarvis Cocker, Noel Gallagher, Liam Gallagher, Damon Albarn, Toby Young and Damien Hirst. An excellent documentary capturing the phenomenon of the Britpop passage. It is worth noting that I think that even if you didn’t get the whole Britpop experience it is still worth watching to try and understand exactly what the period of time tried to encapsulate. Dragging Britain from a period of being totally dormant, to generating great music and creating an aura of genuine invincibility. A highlight of the film has to be the Damien Hirst designed UK quad movie poster. 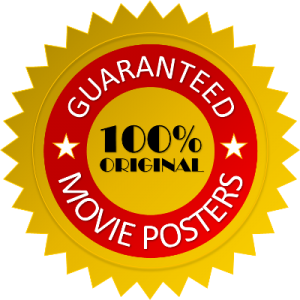 A real eye catching, talking piece poster for a movie that quickly became a cult classic. Genuinely scarce and in very short supply due to its print run of only 1,500 copies and very limited cinema release. Never commercially available I suspect that only around 200 are currently in circulation making genuine examples even more desirable. Limited Edition Damien Hirst prints regularly sell for £1,000+ so this original ”Live Forever” UK quad movie poster represents exceptional value at only £ 150.00. Not only that but it looks really cool !